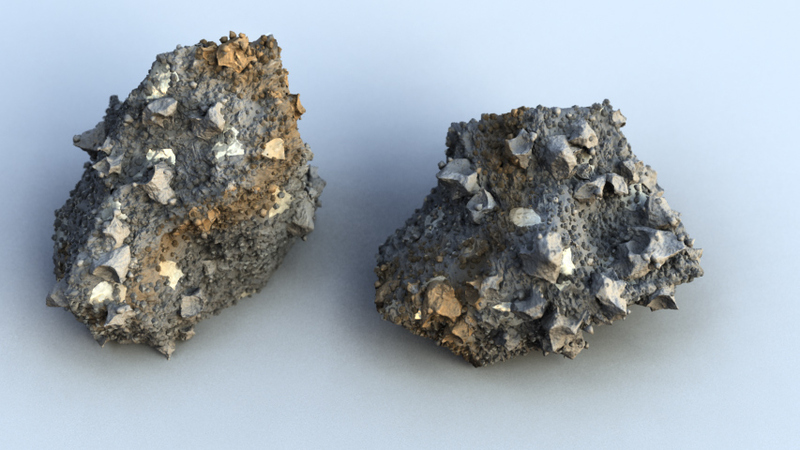 Here's some rocks I posted at the sidefx forums. I thought it would be a nice project to do a few more of these. It's very suitable to do in Houdini, so should be fun. I think the first thing to do would be to generate the basic shape. I'm wondering how to achieve this. 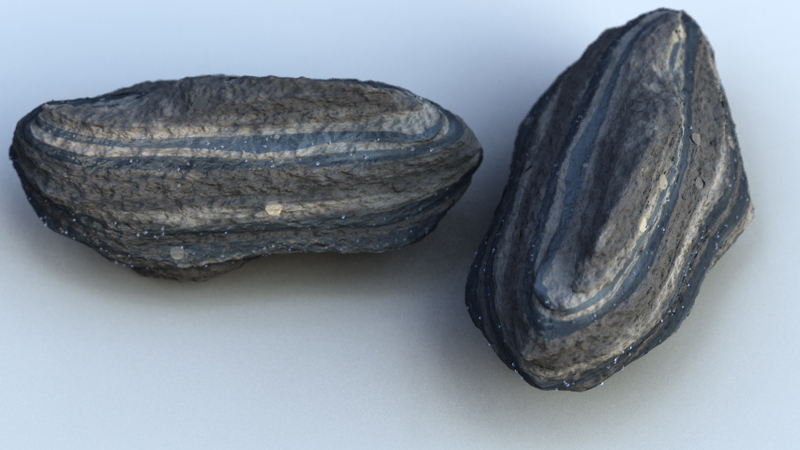 Obsidian breaks like glass for example. 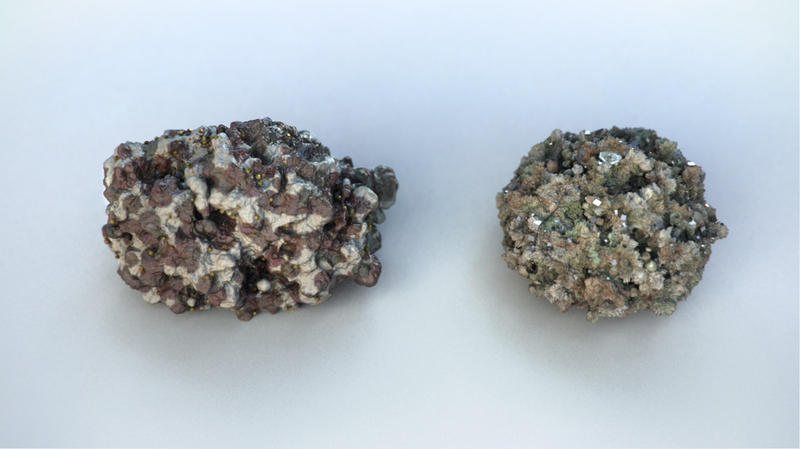 The ones I have posted here look more like naturally occuring metals, or some kind of igneous extrusive with plenty of volatiles. 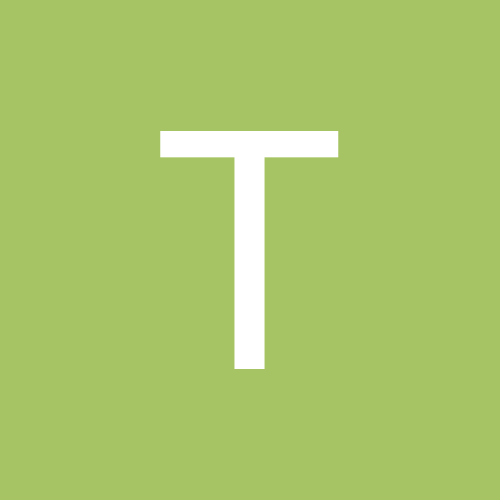 So, how do I best achieve a chiselled surface? Lots of booleans? I smoke some of it last night. The basic shape was done by scattering concave objects around the surface and then shaping with a ray sop. 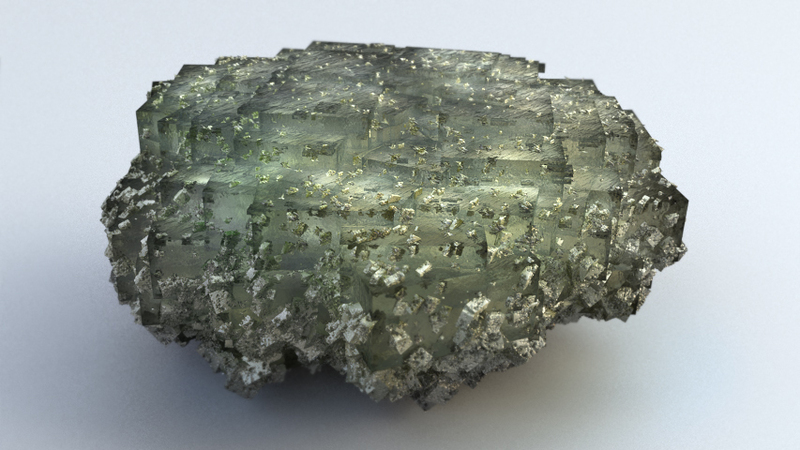 At the moment I have crystals simply copy-stamped on the surface but that isn't very good because they would frequently be fractured more or less along the matrix cleavage. I want it more edgy and I need a way to use and blend different materials on the same surface. 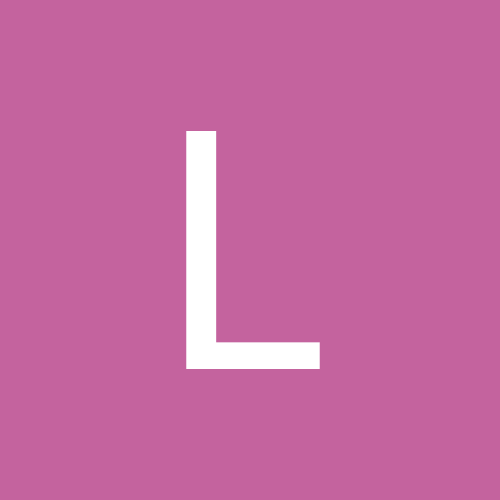 Can I drive a material parameter by simply typing an attribute in? Kind of a burnt pink granite with orthoclase megacrysts for which I used a cookie to define groups that I made with copy-stamped objects. 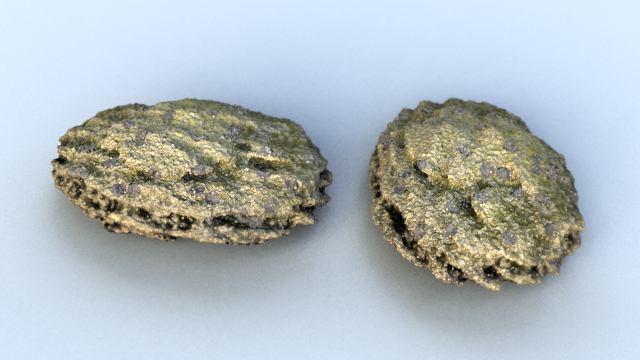 For the layered look I varied the density in a volume, scattered points, and copied deformed metaballs onto them, but it doesn't work well for small stratification patterns. Very nice and interesting stuff! First of all, very nice work! Really like the volume based one! You can't drive a material parameter by simply typing the attribute in one of the material parameter text boxes. You will have to create a parameter inside the shader that has the same name as the attribute you want to drive something with. It is fairly easy to do. Have a look at the "basic surface" material. In the parameters window it has a "Use point colors" checkbox. Now go inside of the basic material in shops, go in the vex surface shop, then go inside the "surface color" node (the big one with all the inputs). Inside of that one you can see how Cd is brought into the shader. The purple nodes are point attributes that can be used, you can make your own parameters, just make sure the spelling of the attribute is exactly the same and the type (float,vector,float) is the same as well. In a very similar fashion you can create arbitrary output variables (the green nodes), that can be used for rendering those attributes as different layers in an .exr . Some conglomerates. I tried to get more visible bedding structures but I still find it tricky to get finely detailed layers. 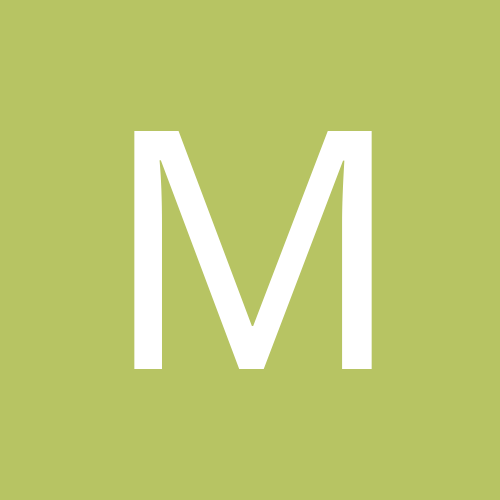 Something metamorphic. Slate? The bedding is improving but I'd like the foliation to be more distinct. 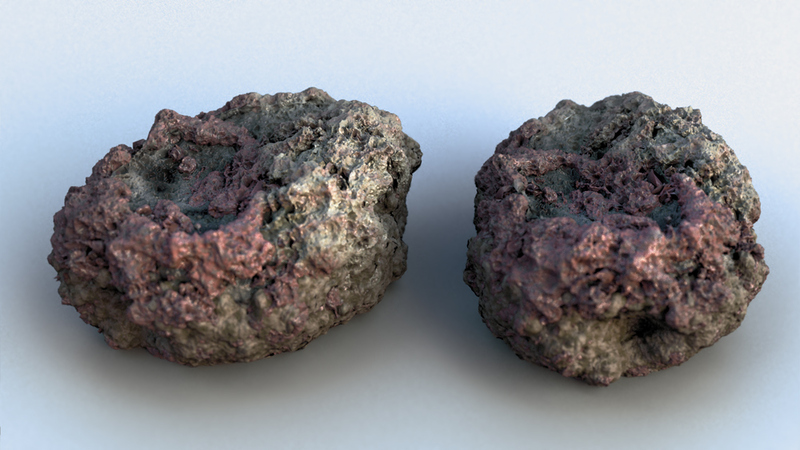 I really love Houdini for making rocks. Second to none, it's great fun! Breccia. I tried to get clasts with sharp, broken edges. Using the peak SOP was the key to this. My first mineral here. 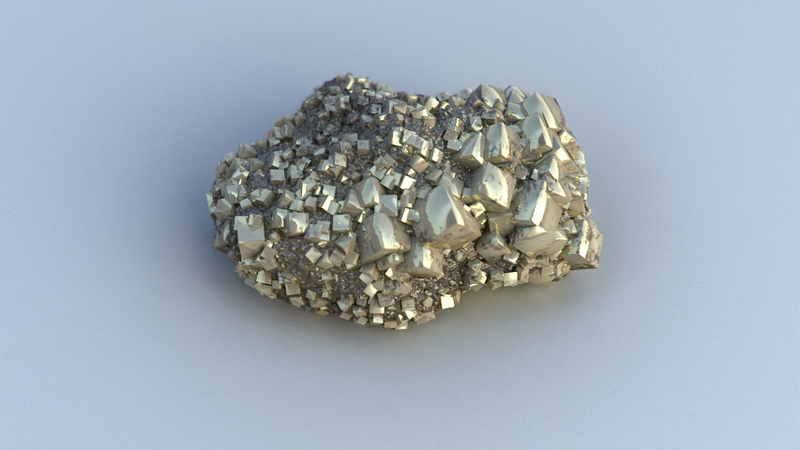 Good old pyrite. I want to try something translucent next. 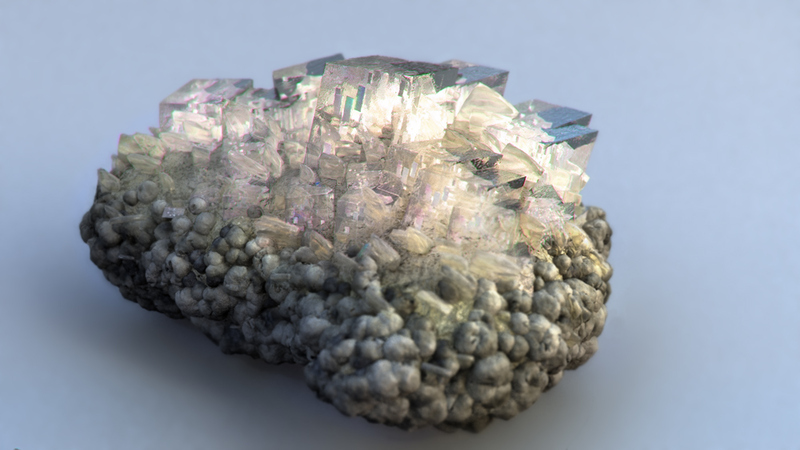 Is there a good SSS shader with displacement (that works in houdini 10) anywhere? Maybe salt crystals. I'd lick them if I knew they were. 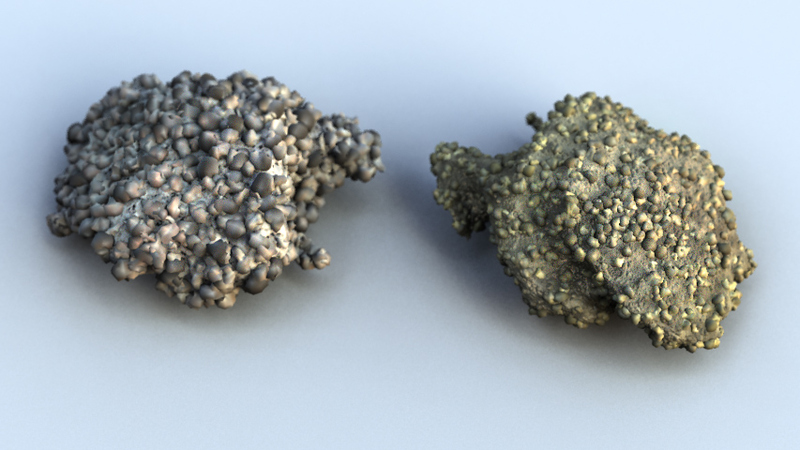 It's a lot harder to render than plain (but beautiful) rocks. 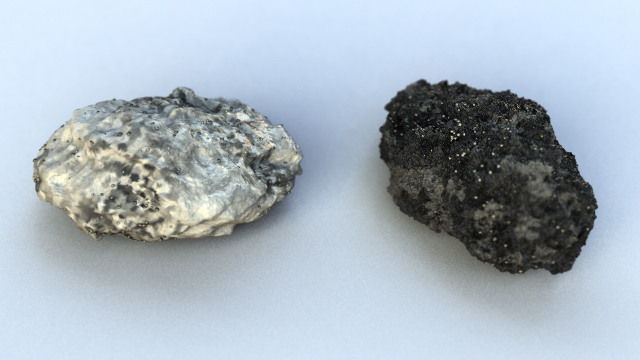 I unchecked true displacement and used PBR rendering. There's a lot missing. No dispersion or birefringence yet, no pleochroism, nor have I found a good way to do internal cleavage and fracture structures. I did vary the IOR with an attribute though. That may be a way forward if I find out how to transfer attributes with pointclouds. If you get enough of these images, a museum might put them on the wall in high resolution! (I'm serious, you really should consider an exposition if you are into that). Imaginary crystals but I was inspired by calcite with its rhombohedral shape and weird internal planes. It took absolutely ages to render, perhaps because of caustics. It's certainly not the way to go. 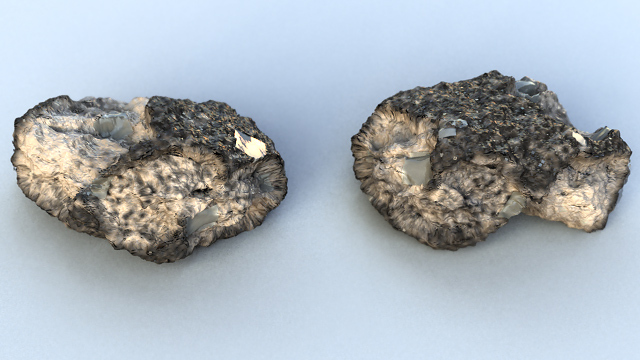 An extrusive, scoria type rock.